Type 2 diabetes occurs when the body is experiencing insulin resistance, which means that it does not make or use insulin well. This causes glucose to build up in the blood instead of reaching the cells, leading to hyperglycemia (excess blood sugar). Hyperglycemia can result in problems with the kidney, vision loss, nerve damage, mobility issues, slowed healing, and cardiovascular disease. Why are the elderly at risk? While type 2 diabetes is more common in adults, it’s even more common in the elderly. The risk of getting the disease increases as you age, especially after 45, due to higher possibility of weight gain and decreased cell function, among other factors. In fact, the CDC estimates that “25 percent of people ages 65 and older are living with diabetes.” This makes type 2 diabetes a major health issue for seniors. Excess weight is one of the major causes of type 2 diabetes, so it makes sense that losing weight is a key factor in managing the disease. The next two tips, exercising and eating the right foods, will help you maintain a healthy weight. As noted above, regular exercise will encourage weight loss. In addition, physical activity reduces your blood sugar and helps your muscles efficiently use glucose. Other benefits include a lower cholesterol level and blood pressure, decreased depression, and improved stamina. The best way to optimize all of these benefits is to take up a regular schedule of aerobic exercises and strength training. Aerobic activity, such as walking, biking, swimming, and gardening, should be done for 30 minutes a day at least 5 days a week. The recommended time for strength training is twice a week. Taking up strength training can be intimidating as you age, but there are a number of options that don’t include free weights, such as yoga and resistance bands. Those with type 2 diabetes are generally advised to make changes to their diet. It’s recommended that you increase their intake of vegetables and plant-based foods, as well as whole grains. In addition, you should reduce the sugar in their diet and avoid unhealthy fats. Keeping up regular appointments— e.g., checkups, kidney checkups, eye exams— will help you stay on top of your diabetes. It will also ensure that minor health problems that are a result of your diabetes don’t turn into major ones. While your doctors can help you stay on top of your diabetes, it’s up you to take ownership of your condition. This means asking questions, regularly monitoring your blood glucose levels, following your doctor’s advice, and never missing a dose of medication. If you are older, enlist a family member or loved one to make sure you’re doing everything you should be to manage your diabetes. Often, if diet and exercise aren’t enough to manage your diabetes, your doctor will decide on a medical treatment. This can come in the form of oral medication, insulin treatment, or a combination of both. 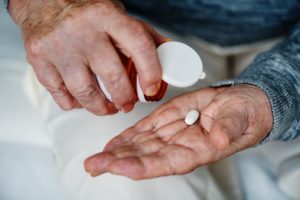 There are a variety of medications out there, and they can do everything from stimulating the pancreas to make more insulin to inhibiting the breakdown of complex carbs. If meds aren’t enough to control to blood sugar, insulin therapy will be recommended. As you get older, it can get harder and harder to manage type 2 diabetes, especially if you live alone. Thankfully, if you have a caregiver or are living in an assisted living group, you can get the help you may need to stay on top of it. Paradise Living Centers offers healthy dining catered to resident’s needs, has weekly stretching activities, and uses an electronic medication management program to ensure every resident gets their proper dosage. If you have any questions about how to best care for someone diagnosed with type 2 diabetes or about our assisted living community, please contact Paradise Living Centers at (480) 878-4112.